Hey everyone! We hope you’re having a good monday. We’re fast approaching our polish phase, meaning we’ll be making passes on prettying up numerous parts of the game. Today we’re performing a pass on the interfaces in the game, and below you’ll find a few work in progress mock-ups. 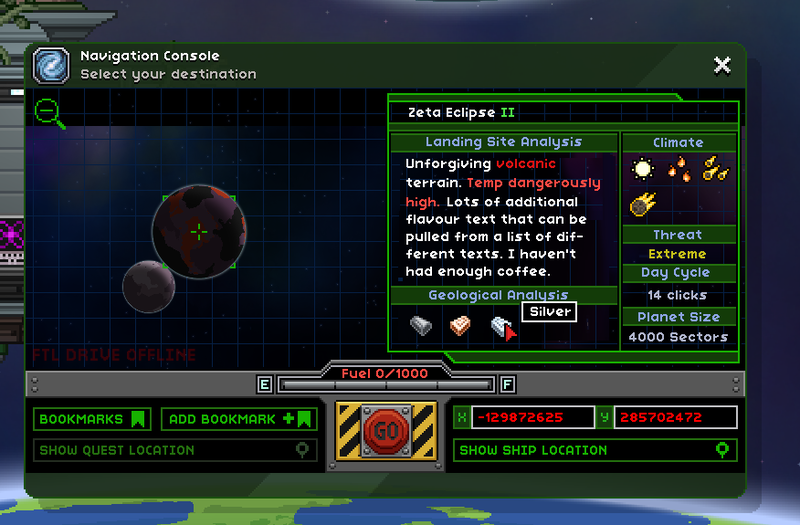 The Navigation Console has been improved to provide more information, such as Quest Location markers and a Geological Analysis, which reveals the type of ores you’re likely to discover! We’ve pulled the Tech Upgrades out of the S.A.I.L interface, and given them their own UI window. ← 21st April – C-c-c-combo Maker!